You see rail speeds gradually increasing from the walking pace of the horse to the now relatively common-place several hundred miles an hour in some countries. Where the speeds will stop is anyone's guess but the 357mph of the TGV (on our rails I may add!) has stood for quite a while (over 10 years) on conventional rail track. On maglev track the Japanese have racked up 375mph and with all the hype about Hyperloop activity going on of late, which touts potential speeds of twice conventional rail, it is uncertain where the need for speed will stop. You also see the rail networks being utilised to higher degrees. Operating times have increased up to 24-hours, and the density of trains increases as headway between them is decreased by more sophisticated signalling systems. The fundamental part of the railway – the rail – has evolved too. From wooden beginnings, iron and then steel quickly took over to provide a more wear resistant solution. Looking back, rail lengths have also been on the rise – from early rails less than 2 metres in length they have grown by 60 times with 120m now in use in Europe. So why have rail lengths increased by so much? There are many reasons, but I’ll explore just one in this article – joining rails reliably is difficult. If you take a look at the number of joints needed to make a single kilometre of track, you’ll see just what a huge effect on the number of joints needed the rail length has. Now, of course, there are different technologies for joining rails but they boil down to two categories – bolting the ends together, and welding them together. Welding is the most reliable and lowest maintenance of these two and is the preferred solution for most applications. 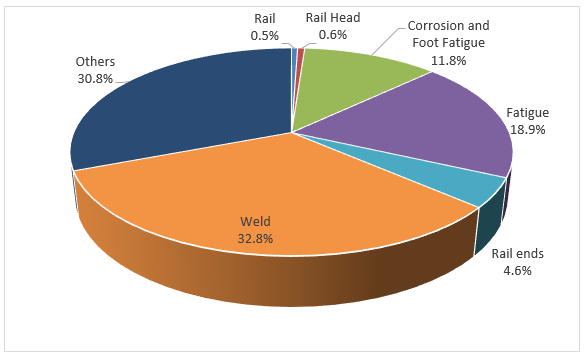 Taking a look at the number of broken rails for some networks you can see that over a third of broken rails happen at the rail-end or weld, (there are a lot more welds than rail-ends in modern track). Minimising the number of welds/rail-ends clearly helps reduce the number of potential failure points, and so provides a safer and more reliable network. And so that is why rail lengths have increased over time. The challenge is of course handling these rail lengths, but perhaps that is an article for another day. I hope you’ve enjoyed this little look into rail. Please feel free to follow my other rail related posts on LinkedIn and of course follow our rail twitter account.